Non-Catholics may not understand the meaning of Eucharist. As for my personal experience, I strongly believe that every time I receive the communion, I actually do receive the Body and Blood of Christ. I don’t want to go all theological here but simply to share my love for the Eucharist. I will never forget the day I received my First Communion. My white dress was custom made for me and the leftover lace meant for the dress was made into my veil. I was the only one with my own veil since the other girls were wearing veils provided by the church. It was the first mass, sadly said the first mass I was fully concentrate in participating. As a child I usually busy daydreaming during mass, not entirely understood the meaning of the mass. Fast forward into present time, my love for the Eucharist deepen. Thank the Good Lord for that. I actually do feel empty or lack of something if I go on another day without receiving Him in Body and Blood. Of course, a spiritual communion is another option. Yet, the walk to the altar in the few seconds before I open up my palms in front of the communion ministers is meaningful to me. Imagine having your boyfriend or girlfriend open up his/her arms in front of you, waiting for your embrace. The heart-pumping moments lead to the embrace is somehow gratifying. And when you finally hug and hold your loved one tight, that is the closest feeling I have to describe my feeling when I was in communion with our Lord Jesus Christ. My parish English choir introduced to the congregation a contemporary communion song which was a rare thing for them to do that. I absolutely love the music and lyric, highly suggest that you go and listen to this song if you haven’t. Here is the link to the song on Youtube. Find forgiveness at the cross. Around the table of the King. Paid the price to make us one. To receive the life of God. As His body here on earth. We proclaim Christ will come again! 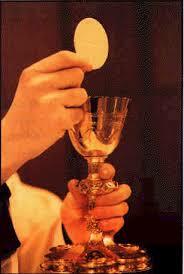 Basically, to receive His body and blood in the Holy Eucharist is like a physical embrace with Our Lord Jesus Christ. If you really love someone, don’t you want to hug him/her everyday?